SKU: FR-600 Category: Weather Seal Brands: Repair Parts. Weather stripping is a low-cost high reward feature that is recommended to extend the life of your garage door. Parts Mart. 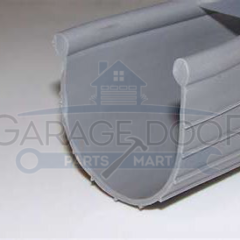 has door bottom six-inch T vinyl weather seal for garage doors manufactured by a wide array of companies including: Amarr, Arm-R-Lite, CHI, Clopay, DBCI, Deldon, Gadco, Martin, Raynor, Richard Wilcox, and Safeway garage doors. This weather seal may also fit brands. This six-inch garage door bottom seal, T rubber and vinyl seal T rubber seal is made of EPDM synthetic rubber. This seal is available in black and designed with a ¼ inch “T” to fit popular T-style retainers. No sealants are needed when installing these rubber seals. They are designed to slide into the track on the bottom of the door. Folding the ends in will keep this weather sealant in place.